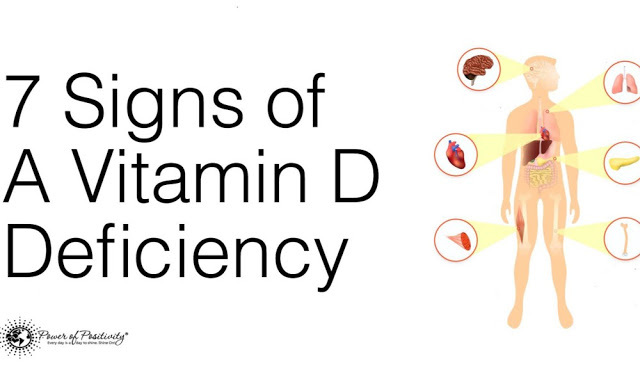 Vitamin D is perhaps the most important nutrient when discussing bone or immune system health. Not only does adequate consumption of vitamin D preserve bone and immune system health, it’s also thought to prevent a number of serious health conditions. A deficiency of vitamin D is best known for causing rickets (brittle bones) in children, a condition in which the tissue of the bone doesn’t fortify or mineralize. This condition often leads to fragile bones and skeletal deformities, frequently coinciding with increased risk of injury. However, more recent research is uncovering the link between vitamin D deficiency and a host of other health conditions. Research suggests that vitamin D may play a role in both the prevention and treatment of hypertension, type1 and type2 diabetes, multiple sclerosis (MS), and hypertension. Given the importance of consuming vitamin D, we’ll identify seven different ways to uncover a potential vitamin D deficiency. Armed with this knowledge, we’ll but in a better position to correct any shortfall and safeguard our health. The degree of pain and muscle weakness can vary from subtle to severe. Initially, symptoms of this type are almost non-present; however, as the deficiency becomes longer in duration, associated symptoms tend to become worse. The reason is that vitamin D, when metabolized, enhances muscle contraction – an essential mechanism for strengthening bones. When vitamin D levels are low, our immune system is inextricably affected. A high concentration of vitamin D receptors can be found in the immune cells, an area of the body that requires sufficient vitamin D supplementation. In one Japanese study published in the American Journal of Clinical Nutrition, schoolchildren that were given vitamin D supplements recorded fewer instances of the flu strain influenza A than those who did not receive supplements. In another study, individuals diagnosed with an autoimmune disease also tested for low levels of D vitamin. Hypertension (high blood pressure) often results when the body’s levels of vitamin D are low. Our body formulates a peptide that increases blood pressure through arterial restriction and water retention. Vitamin D serves as a countermeasure, suppressing this enzymatic reaction and reducing the body’s inappropriate and exacerbated response to this peptide, thus normalizing blood pressure levels. A link has been made between sadness/depression and low levels of vitamin D. One particularly interesting discovery involves the correlation between seasonal affective disorder (SAD), a seasonal depressive condition, and fluctuating levels of vitamin D3. In one study, participants given D3 supplementation experienced enhanced positive effects and a reduction of negative effects – both physical and cognitive. Participants reported a significantly diminished presence of various symptoms, including food craving, hypersomnia, lethargy, and sleep disturbances. Certain gastrointestinal conditions affect vitamin D absorption. Those with celiac, Crohn’s, inflammatory bowel disease and other conditions, are likely to be at a greater risk of vitamin D deficiency because of these interactions. Furthermore, those with high amounts of body fat are prone to vitamin D deficiency since fat dilutes the vitamin and reduces its physiological effects. A strange addition to this list is the tendency of people to sweat more without sufficient vitamin D levels. Contrary to many of the items on this list, medical experts aren’t quite certain why we sweat more with low vitamin D levels. All that’s known is that there seems to be an inseparable link between low vitamin D and excessive sweating, especially around the forehead. There exists a probable correlation between low vitamin D levels and cardiovascular disease. Medical professionals believe that low levels of the vitamin result in higher concentrations of calcium build up in the arteries; calcium buildup is plaque that forms in the arteries and increases the risk of heart attack or stroke. Other conditions linked to low vitamin D levels – hypertension, type 2 diabetes, obesity and high cholesterol – appear to solidify the connection between vitamin D levels and heart health. Now that we’ve discussed seven symptoms associated with vitamin D deficiency, we’ll list some common sources of the nutrient. Remember to get the recommended daily amount of vitamin D on a daily basis.